10th International Conference on Chinese Medicine, Ayurveda & Acupuncture (Chinese Medicine 2019) hosted by Conference Series took place during March 04-05, 2019 at Berlin, Germany. Active participation and generous response were received from the Organizing Committee Members, Editorial Board Members of Journals as well as from eminent scientists, talented researchers and young student community. Researchers and students who attended from different parts of the world has made the conference one of the most successful and productive events in 2019 from Conference Series. 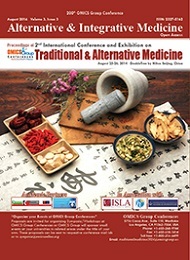 The conference was marked with the presence of renowned scientists, talented young researchers, students and business delegates driving the three days event into the path of success with thought provoking keynote and plenary presentations highlighting the theme, “Traditional Alternative Medicine; A way Forward to Better Therapy”. Conference Series has taken the privilege of felicitating Chinese Medicine 2019 Organizing Committee, Editorial Board Members and Keynote Speakers who supported for the success of this event. Conference Series, on behalf of the conference sponsor appreciates all the participants who put their efforts for this event and sincerely wishes them success in future endeavours. The esteemed guests, Keynote speakers, well-known researchers and delegates shared their innovative research and vast experience through their fabulous presentations at the podium of grand Chinese Medicine 2019. We are glad to inform that all accepted abstracts for the conference have been indexed in “Journal of Alternative & Integrative Medicine” as a special issue. Thanks to all our wonderful speakers and conference attendees, Chinese Medicine 2019 Conference was our best! !